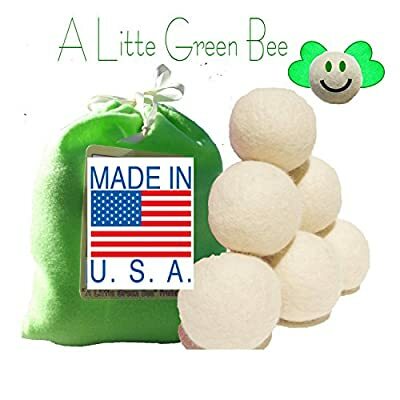 This lot contains six wool dryer balls made by "A Little Green Bee". These Dryer Balls are 100% HANDMADE IN THE U.S.A. They are completely made out of wool, inside and out. We use wool roving to form the ball. They are a little larger than the size of a tennis ball and will shrink slightly over time. They are "All-Natural". All natural means that this product is 100% free from any synthetic fibers. These cute little felted wool balls are designed to reduce drying time, soften fabrics, cut down on static, decrease lint, and reduce wrinkles. Because they are reusable, you will never need to purchase fabric softener or dryer sheets. And unlike other wool dryer balls made from yarn, they will not unravel and will last for years. Over time your Wool Dryer Balls will develop pills on them (If they bother you- just run a sweater depiller or light razor over them to remove pills). These balls last for years and the more pilling the better. Pills = softer clothing because there is more surface friction. They get better with age. Put away those chemical dryer sheets, protect your family and the environment, and go green with natural dryer balls! . 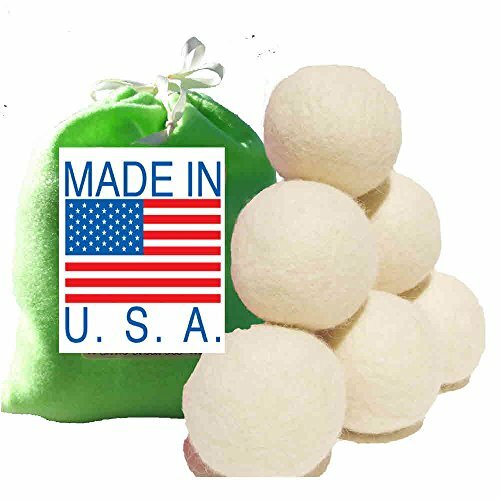 Six 100% wool balls dryer balls made from domestic sheep in support of American farms Shortens drying time (use 4-6 balls for medium loads) Softens clothes naturally, safe for all clothes Helps to eliminate wrinkles and reduce static. Replaces dryer sheets, and will last for 1000+ loads Please Note: A+ Style is the only authorized seller of "A Little Green Bee" Ecofriendly products.